On a Balinese coffee plantation, during a downpour of torrential proportions, we swilled cups of the world’s priciest and rarest coffee – Kopi Luwak. In gourmet establishments across the globe, this cup of Indonesian java would cost upwards of $50 a cup. This coffee might sound familiar since it has been featured in countless foodie publications, on Oprah, as well as in the film, The Bucket List. 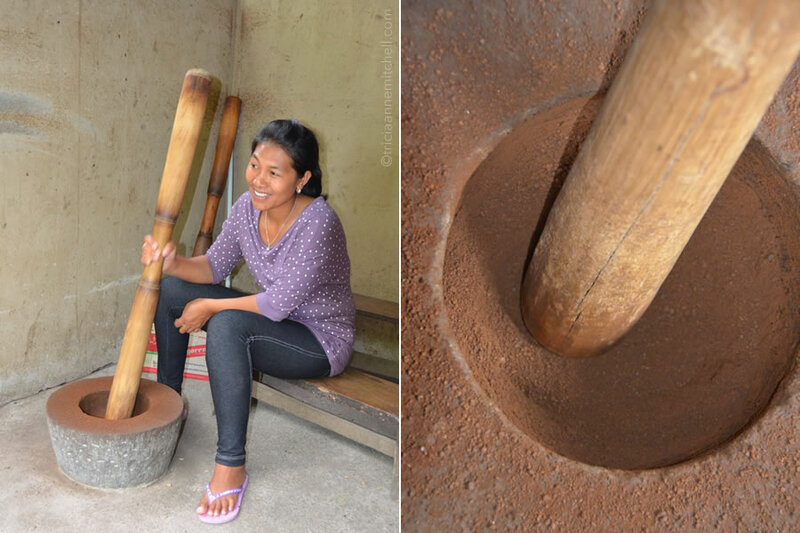 A young woman prepares our cups of Kopi Luwak coffee. The cherry-like fruit of a coffee plant. 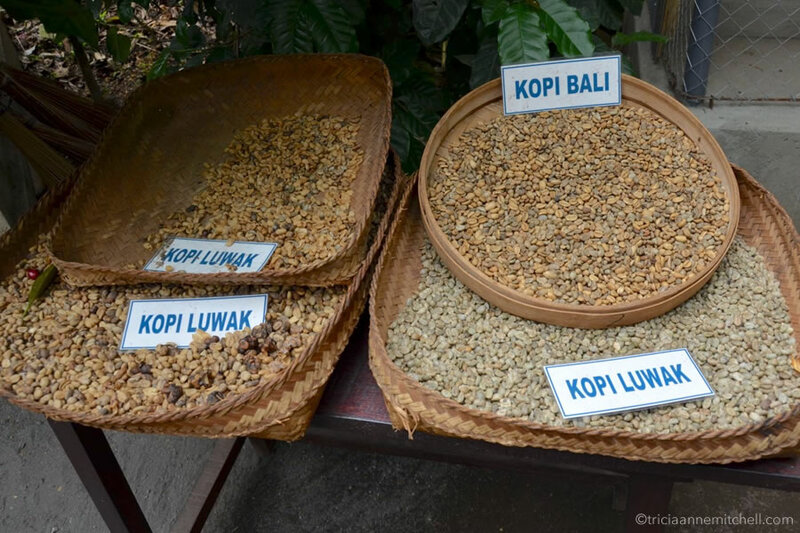 Baskets of Kopi Luwak (the so-called ‘poop coffee’) as well as a basket of regular Balinese coffee (Kopi Bali). The Asian Palm Civet, a weasel or raccoon-like creature, eats coffee bean pods, known as cherries. 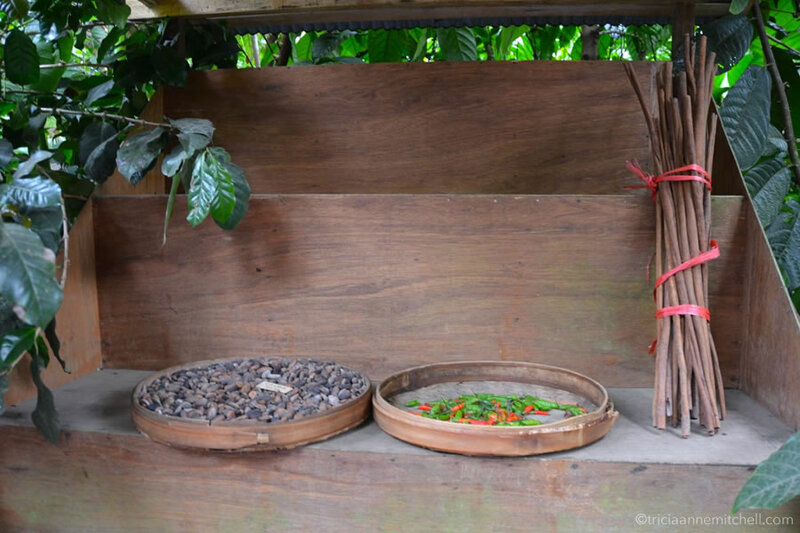 The fruit of the cherry is broken down inside the civet, however, the coffee beans pass through the animal’s digestive tract intact; they are then excreted into sought-after droppings. Studies have shown that the civet’s stomach acids and enzymes digest the beans’ covering and actually ferment the bean. This process breaks down the acidic flavor found in traditional coffee. 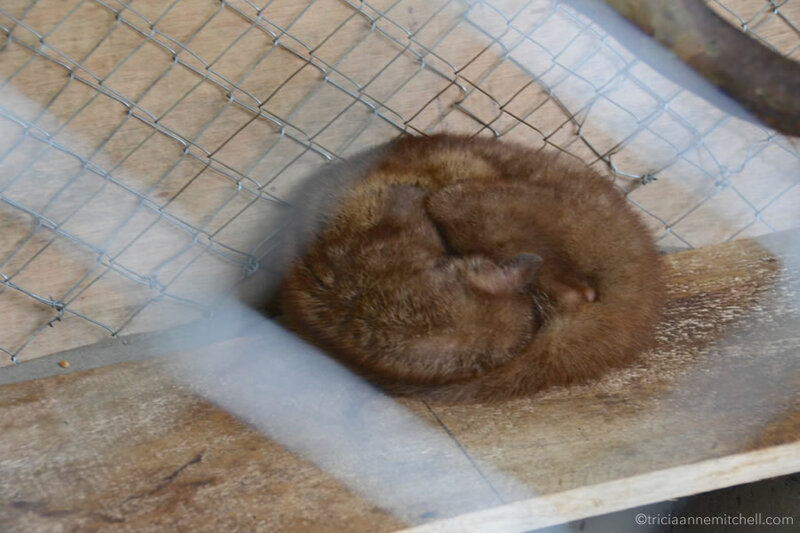 A civet, solo inside a cage, sleeps on a wooden shelf. Locals in Indonesia (Bali, Java, Sumatra, Sulawesi), the Philippines, and East Timor gather the civet’s output. 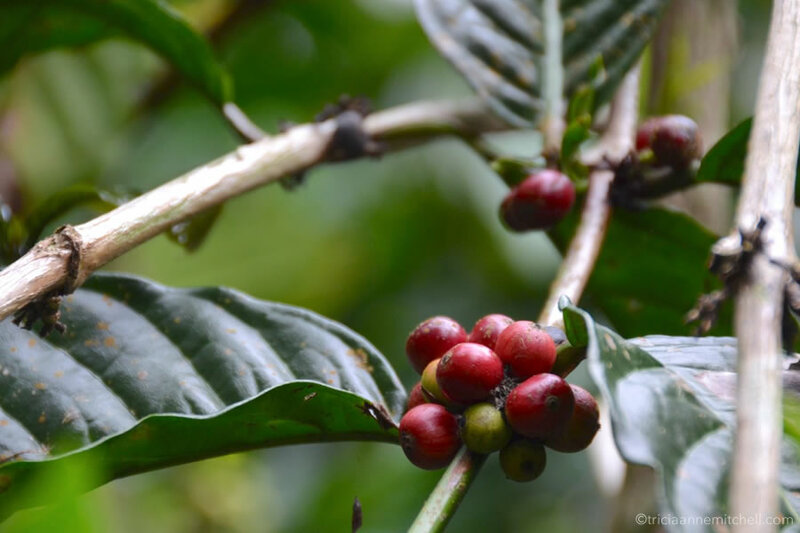 The critters’ pricey poop is then sold to coffee producers who extract, clean, sun-dry and roast the beans. 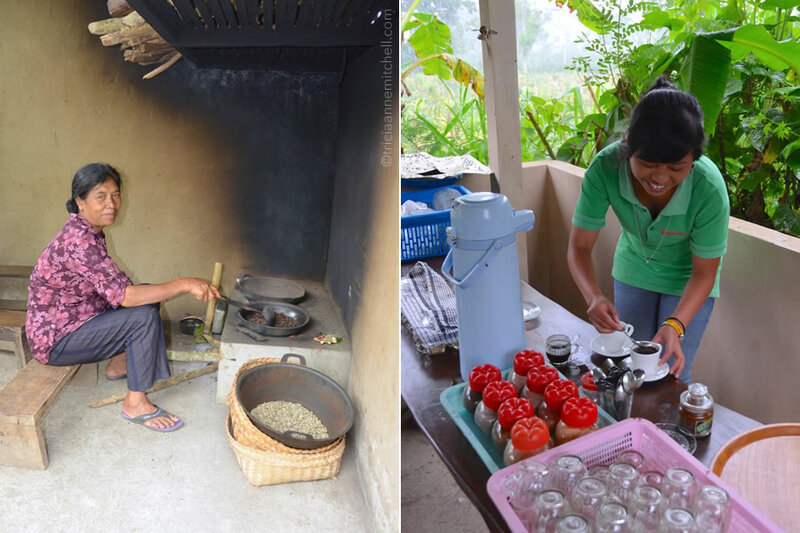 A woman grounds the coffee beans by hand (left), while another roasts them over a fire (right). Kopi Luwak coffee is renowned for its smooth taste – something I noted immediately when enjoying my initial sip of the gourmet brew. I consider myself to be more of a social coffee drinker in that I don’t need coffee infusions multiple times per day. I always neutralize my coffee with milk, to cloak its acidity. Call me a coffee lightweight. The Kopi Luwak flavor was quite different from any other coffees I’ve ever tasted, though. I drank it straight, and was it ever light. It had a hint of a nutty flavor, but no bitter after-taste whatsoever. It was as smooth as the silk batik being touted at practically every souvenir shop in Bali. Shawn and me, during the much-anticipated moment. Of course, $5 for a cup of coffee is an extravagant amount in a country like Indonesia, where the average Balinese worker earns $25 per week. (Keep in mind that Bali is Indonesia’s most well-to-do island; residents in other areas of Indonesia make less.) But for coffee connoisseurs, the price is a steal given that Kopi Luwak sells for between $100 and $600 per pound in most parts of the world. 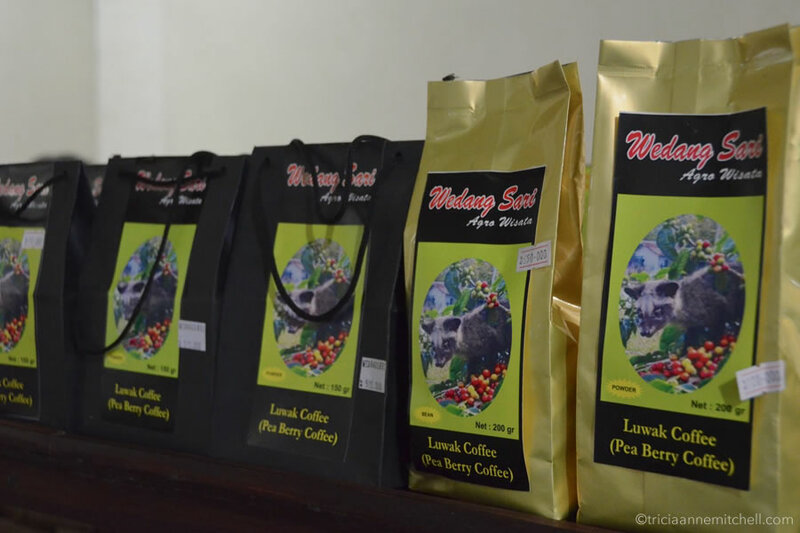 Bags of Luwak Coffee for sale inside the plantation’s gift shop. The 200-gram bag with gold packaging retails at 650,000 Rupiah (approximately $72). 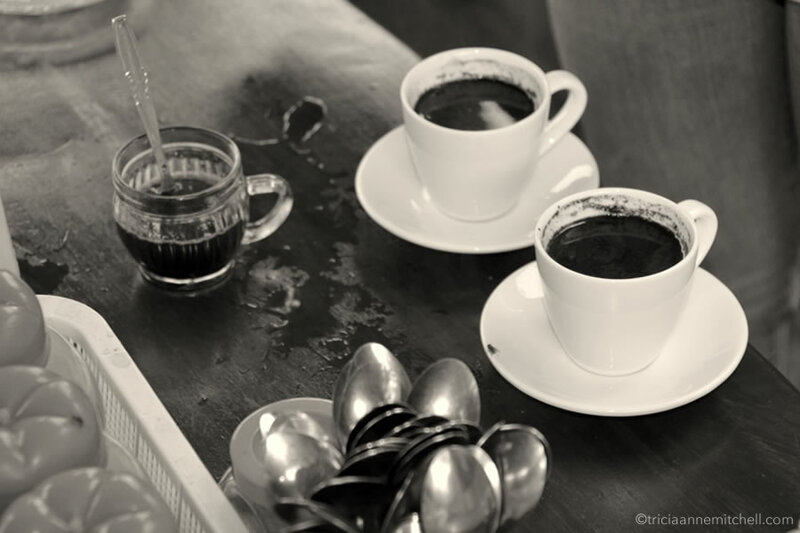 You might be left wondering how Kopi Luwak was ever even discovered – who first took the plunge? It turns out that it was the Indonesians themselves during the era of Dutch colonization(1830-1870). European colonists saw themselves as being culturally superior to the natives, aiming to prevent them from partaking in their environment’s natural resources. 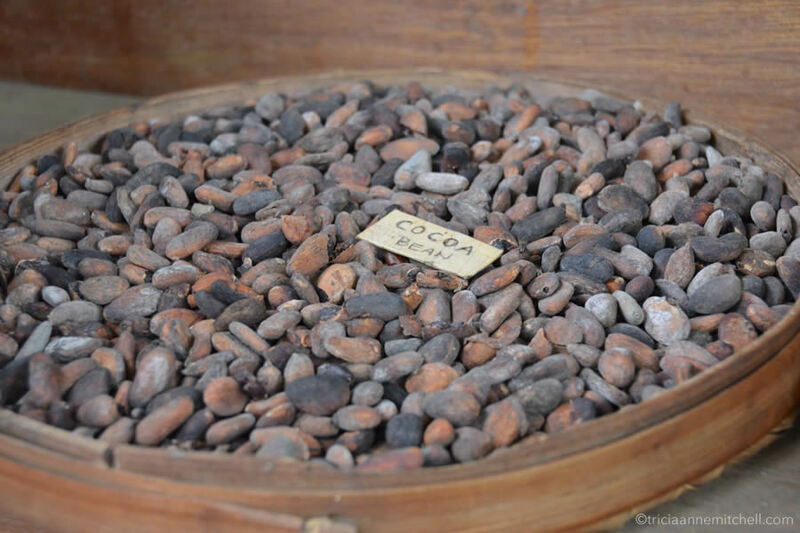 As a result, the Dutch colonists did not allow the locals to pick coffee fruits for their own consumption. Despite the ban on java, native plantation workers and farmers still wanted their own caffeine-kick. 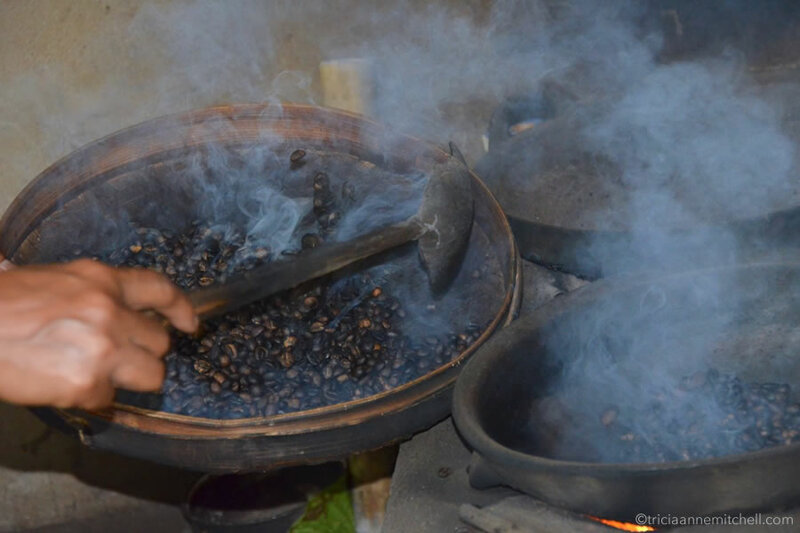 When they saw the coffee-bean plentiful civet droppings, they devised a way to make their own coffee (after processing the beans via the same process used today). It didn’t take long for the Dutch plantation owners themselves to discover the merits of this new coffee blend, turning Kopi Luwak into a popular and expensive treat. 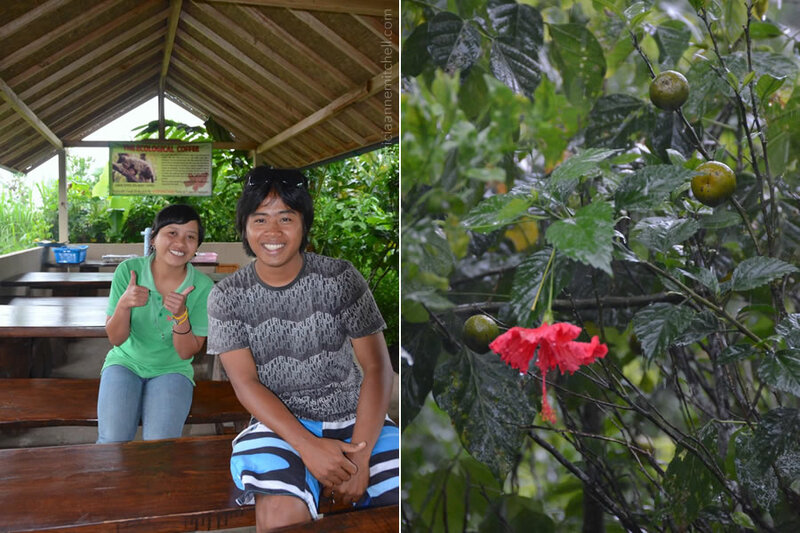 Our Wedang Sari host (left), and guide for the day, Mowgli Wayan. In an era of E-coli and animal-derived illnesses, you might be thinking, “What about harmful germs?” Germ-phobes’ minds can be put at ease thanks to numerous studies that have been conducted by food scientists. It seems that thorough washing and high-temperature roasting kills any frightening organisms. I have a confession to make, though. 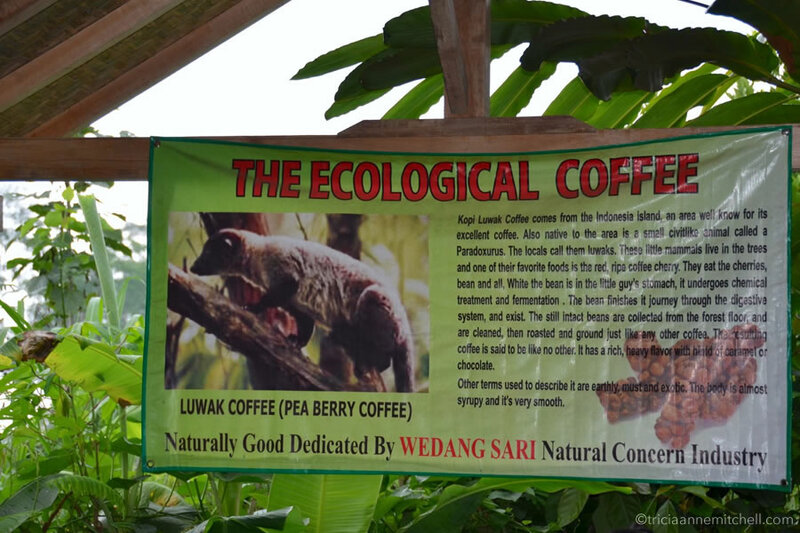 Kopi Luwak wasn’t my favorite beverage at the Wedang Sari Plantation. 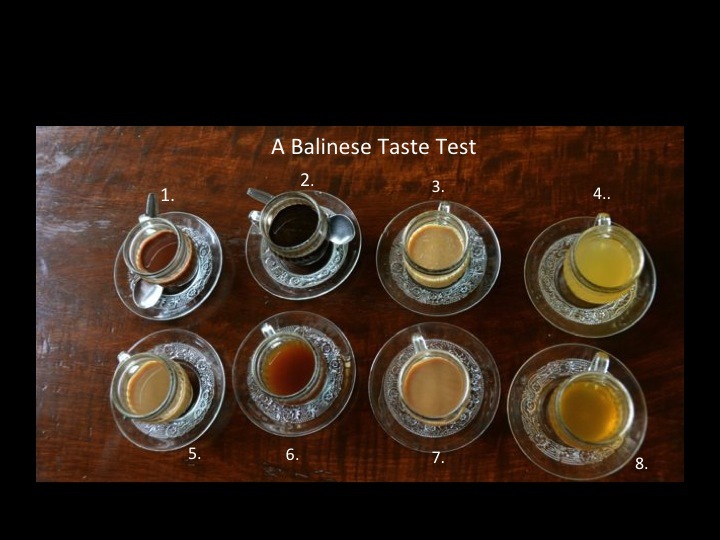 Perhaps I’m unsophisticated in the coffee sense, but I preferred the eight teas and coffees that we sampled after our Kopi Luwak break. Using a mélange of spices grown on the plantation – everything from ginseng and ginger to lemongrass and vanilla – the java and tea tastings were extraordinarily flavorful. Perhaps it would be a culinary crime to corrupt the prized Kopi Luwak beverage by adding a swirl of coconut milk or rich spices, but it’s a punishment I’d be willing to risk. Wedang Sari Plantation address: Ds. Sekaan, Kintamini, Bali. For contact information, see the Wedang Sari Facebook page. 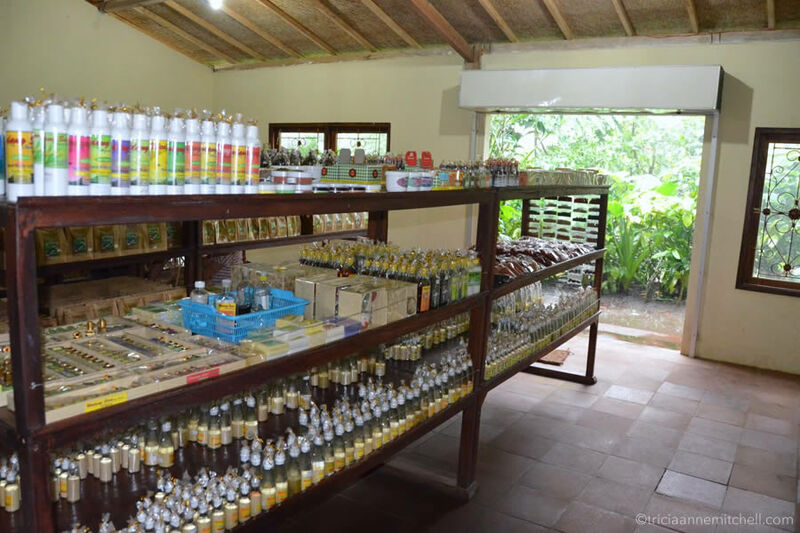 The plantation features a shop with heavenly treats – ranging from vanilla bean stalks, to turmeric, cacao, brown sugar, cinnamon, and of course Kopi Luwak. A 200-gram bag retails at 650,000 Rupiah (or approximately $72). 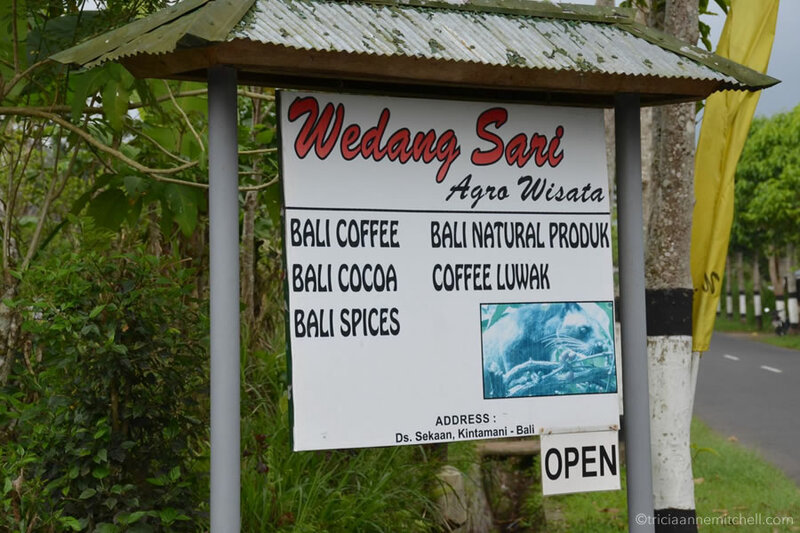 How to Get to the Wedang Sari Plantation: When we approached a travel agency in Ubud, the driver immediately knew of the Wedang Sari Plantation, which is not far from Ubud. It’s about 9 miles, or 15 km. from the Ceking Rice Terrace. We visited the plantation following two brief stops at Goa Gajah (the Elephant Cave Temple) and Gunung Kawi (the Rocky Temple) and prior to having lunch overlooking volcano, Mount Batur. 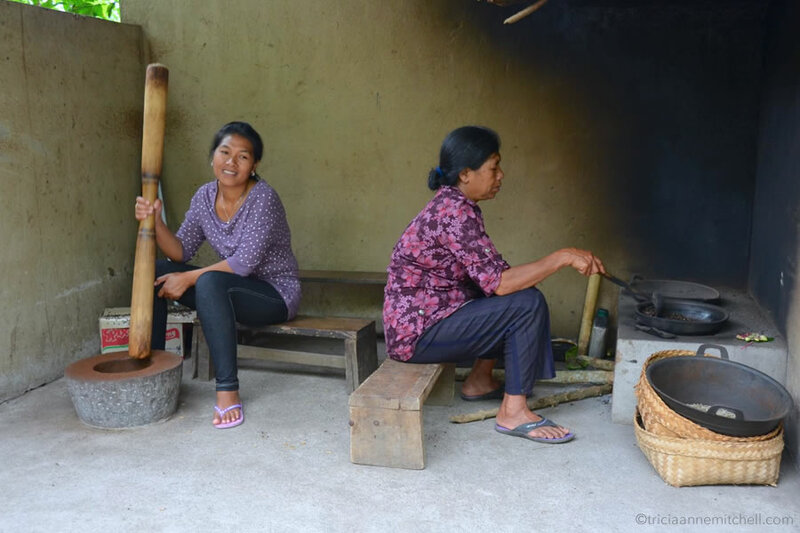 Though Wedang Sari is not a traditional working plantation, visitors can still walk among the various trees bearing cinnamon, cacao, coffee berries and lemon grass offerings. A civet sleeping in a cage (I do not know how long the fellow is left alone, as it seems inhumane to have him in a cage) and pet bat are on display, as are baskets of traditional beans and pre-processed (yes, poopy) Kopi Luwak beans. Staff members roast and ground samples of Kopi Luwak there on-site, and the girl doing the grinding, allowed me to try my hand at pulverizing the beans. “More muscle,” she said. The smell emanating from the grounds was tantalizing! Note: Excerpts of this piece were also re-published on the Matador Network. Tricia – what a fantastic post. I love anything coffee related (though I try to drink just one cup a day!) and this post and your pictures caught my attention immediately. I have heard about this coffee (or something similar – maybe on Andrew Zimmern’s show?) and appreciate you sharing the story. What wonderful adventures you’re having and how lush is that countryside?! Is it ever lush! This is the low-season to visit Bali (likely due to the heat and it being the rainy season) but I’m enjoying the timing immensely. 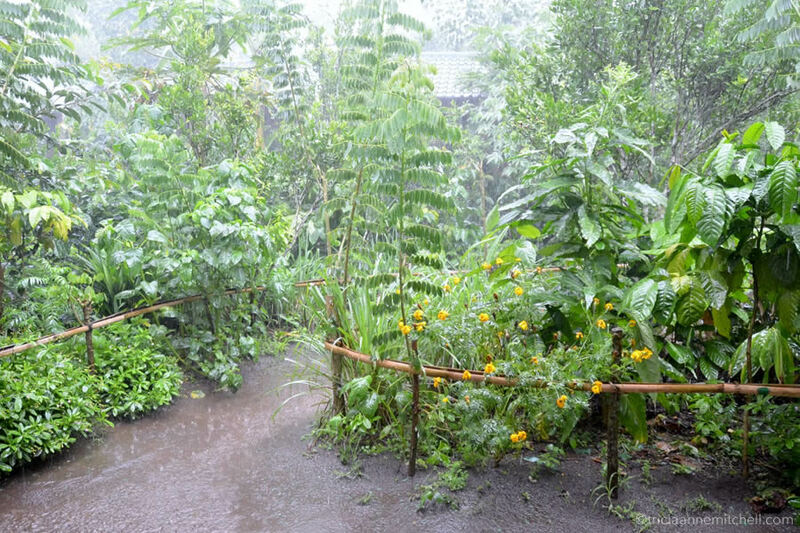 It’s fun experiencing the downpours that quench all this incredible flora and fauna! I had to google Andrew Zimmern (I’ve been living in Germany for the past 10 years, so a bit disconnected) and I realized that my husband and I watched one of his episodes from iTunes prior to coming to Bali. He was covering some of the more unusual Balinese practices (the tooth-filing ceremony, drinking cobra blood, etc.). I think imbibing Kopi Luwak might be as adventurous as I’ll get here! 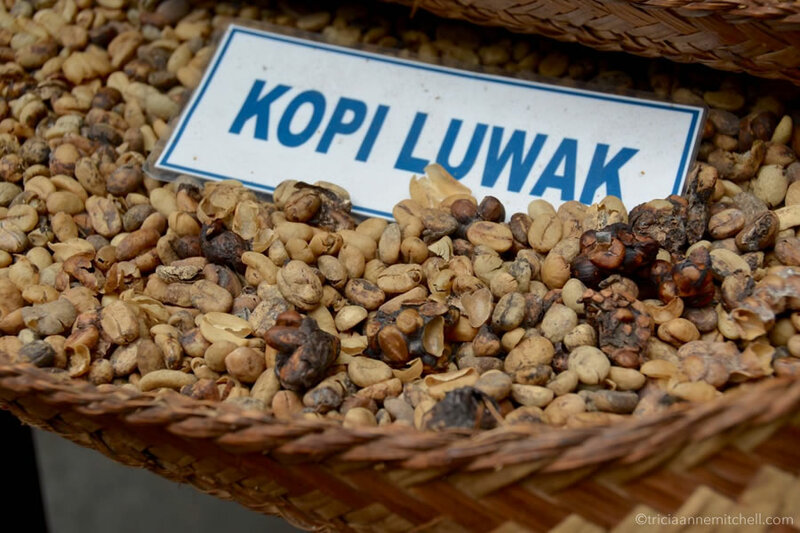 As a light coffee drinker, do you think you’d give Kopi Luwak a whirl? I would definitely try Kopi Luwak. I can drink a strong espresso no problem. It’s just that ever since taking up Bikram yoga, my craving for coffee in general has subsided. Though I do love coffee and anything to do with it – I don’t know why?! Maybe it’s all the good coffee I grew up with in Australia that is making me nostalgic. Yes, Andrew Zimmern does go off the beaten track a bit… But he’s alot of fun to watch. Enjoy the last few days of tropical weather in Indonesia. Interesting that since starting Bikram Yoga that you no longer desire coffee. Is it that you’re so energized following the yoga that you don’t need it? Great story. I saw the Bucket List and became acquainted with the coffee then. The pictures complete Morgan Freeman’s narrative. Thanks for sharing. I love that some people are paying $50 a cup for “poop coffee.” That doesn’t mean that I wouldn’t try it while visiting, but I’m not going to drink it just to stay cool and that Oprah told me to if that makes sense. TBM, at $50 I must admit that I wouldn’t have given it a whirl either! Being so close to its source, though, we wanted to see if all the hype was justified. The everyday $1/cup (or less) Balinese coffee is so good here (especially with a nice swirl of milk) that I don’t feel the need to pay $5 for a cup of Kopi Luwak again. It definitely had a different flavor, though and it was a fun experience. After reading this post, I would probably pay $50 for it as I would be too intrigued not too (I would hold off on buying my Kombucha teas for a week to account for it). That said, you can’t go wrong at $5 for that experience. Great post, I’ve learned something new – as usual, great photos too. Jane, so happy you enjoyed the Kopi Luwak account and that you gleaned something from having read it! Being from England, I have a suspicion that you are a tea connoisseur? I loved the incredible selection available in and around Windsor, when we visited there last summer. I also had to buy a little tea cozy to lock in the warmth of our teas for when we returned home. Haha, yes I admit I am a bit of a tea connoisseur. I like all kinds of tea but I’m not so much a fan of coffee. If I am ever to be deprived of my morning coffee, I’d also be looking for an alternate source of beans. It’s a vice I simply have to indulge. 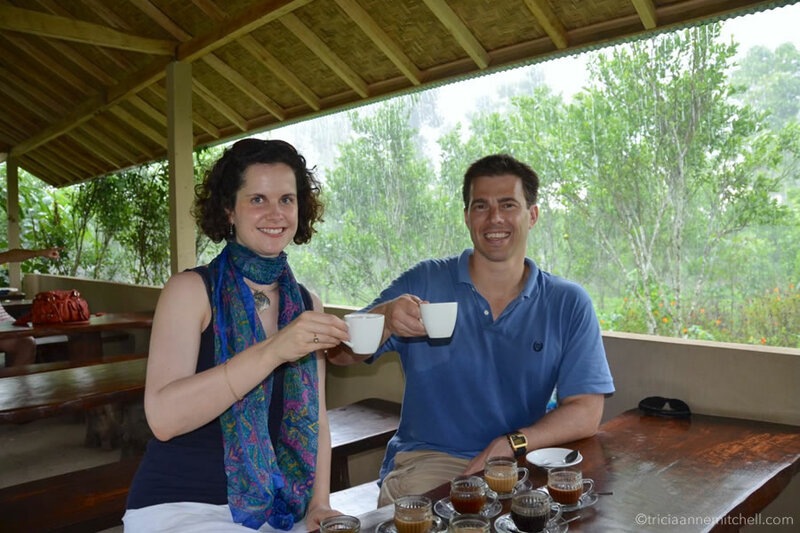 Your coffee addiction sounds reminiscent of my husband’s :) I loved the taste of Kopi Luwak. So smooth. If I had the choice between Kopi Luwak and traditional coffee, I’d have to opt for the former, except the price is rather prohibitive! I think you’re writing in the Philippines… do they a Kopi Luwak equivalent there? I’ve always thought it was solely an Indonesian export, but it seems the Philippines is also a major producer of it. Love learning such tidbits via my wonderful blog readers and through travels :) I wonder if it’s ‘produced’ via the same animal there… So much to learn! It is consumed by the same animal. The end product is called Kape Alamid in the Philippines. There seems to be a mini gold rush for the civet’s poop. Imagine that, a Klondike in the jungles of SE Asia. I enjoyed the ‘straight scoop’ :) I am more of a coffee heavyweight, and having something without the acidity sounds wonderful! Well, I’ll make sure to try it if I am ever in those parts of the world :) Thanks!